Although I am a huge fan of the wines of many regions – Oregon Pinot Noir, Beaujolais from the ten Crus, the amazing reds of Gigondas, and whites of the Rhone – I have limited my evangelizing to the wines of my home state. Admittedly, I am not a fan of all Virginia wines, but I am a passionate advocate of the Virginia wine industry, and enjoy introducing friends to the wines of Virginia. During my work travels over the last few years, I’ve hosted several tastings in other states – Florida, California, and Colorado – to introduce friends to Virginia wine (many for the first time). Unfortunately, distribution to these states is very limited or non-existent so my friends are rarely, if ever, able to find the Virginia wines we enjoy at these tastings. Ironically, although distribution of Virginia wine is limited, or non-existent, in many States, Virginia wine is widely available throughout London and Southern England. I was aware of Virginia wine being available on a couple of restaurant wine lists in the UK, but did not know that wines of the Commonwealth were available in retail locations. It took one of my friends, who recently moved to London, to email me about finding a Keswick Vineyards wine at his local Whole Foods in Kensington. I’ve been in that Whole Foods a number of times, but never noticed the Virginia wine section of 15 wines so I was somewhat surprised to hear that Virginia wines were available there at all. The irony of Virginia wines being available 3,800 miles across the Atlantic Ocean, but not in many US States was not lost on me. It seems as if many distributors could take a lesson from the importer responsible for creating the market for Virginia wine across the pond. On a recent trip to London in April, I had the occasion to meet up with the person responsible for placing Virginia wines in restaurants and retail locations throughout the UK market – Chris Parker, proprietor of New Horizon Wines. Chris and I met at one of London’s most prominent locations with Virginia wines on the menu, Bar Boulud at the Mandarin Oriental Hyde Park, to talk about the expansion of Virginia wine in to the UK. 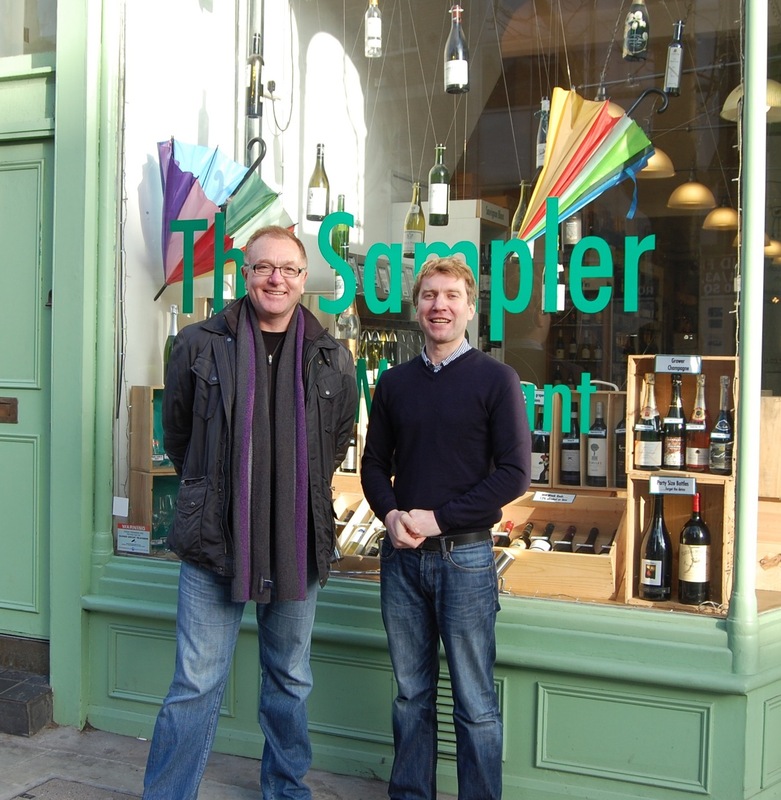 Chris (on left) with Sebastien Crozatier, the Store Manager at The Sampler in Islington, London. DWYL: Chris, why did you start New Horizon Wines? I deeply believe that the Virginia wine region has potential for considerable growth over the long term. International demand will play a significant part in the realization of that vision. New Horizon was established to develop the international market for the wines of Virginia. The strong historical connection between the UK and Virginia is a significant part of our story and one of drivers for us to focus initially on the UK market along with the fact the UK is the world’s largest importer of wines with a retail value of £7.6 billion ($12.1 billion). DWYL: What Virginia wine brands are currently available in the UK market? Our current portfolio includes an exciting range of wines from a number of Virginia wineries including, Barboursville Vineyards, Breaux Vineyards, Boxwood Winery, Veritas Vineyards, Veramar Vineyard, White Hall Vineyards, Williamsburg Winery, Keswick Vineyards, and Rappahannock Cellars. We are planning to add more wines and wineries as demand grows. A selection of Virginia wines at Whole Foods, Kensington, London. 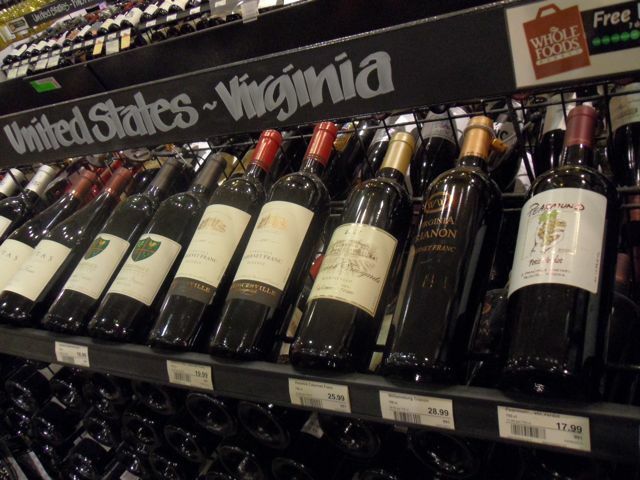 DWYL: Which Virginia wines are popular with UK consumers? The varietals of most interest so far are Viognier, Cabernet Franc and Petit Verdot. Virginia’s red blends in the classic Bordeaux styles are also very popular. 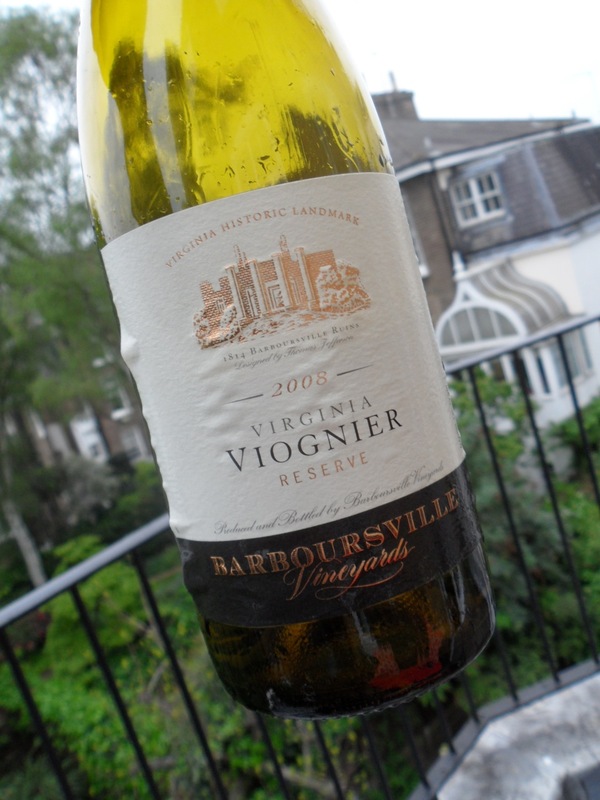 Picked up this Barboursville Viognier at Whole Foods Kensington (17.99 GBP) for a Viognier tasting with friends. DWYL: It’s impressive to see Virginia wine on the list at such an established brand as Bar Boulud, named for the global super chef, Daniel Boulud. Where else can Virginia wine be found in the UK? We now have a range of Virginia wines at top UK independent wine merchants, retailers and restaurants including the Oxford Wine Company, The Sampler, Whole Foods Market, Zuma at Knightsbridge, London. Boxwood on the menu at Bar Boulud. DWYL: What’s the next step for New Horizon wines in terms of expanding the Virginia wine brand internationally? Our immediate focus is to build on the initial demand we have created. Our longer-term plan includes wine tourism combining wine, education, and travel to Virginia. We are the international Virginia wine specialists and the wines I selected for our portfolio are being judged based on their quality and value compared to many other wines from around the world. The professional wine buyers, sommeliers and consumers in the UK were unaware of Virginia as a wine-producing region when we started our business in 2009. We are just scratching the surface and we are already experiencing a healthy demand particularly for Viogniers. The UK is an important market not just for wine export, but also as an influencing factor in how Virginia wines are perceived nationally and internationally. I started from scratch with a vision and belief and I am pleased to say that two years later some of the top wine merchants, retailers, and restaurants in the UK are our customers. I believe strongly in staying focused and we have a lot of work to do expanding our business. We have a great working relationship with the wineries and we have consistently presented the “Virginia Wine Story” that benefits the wineries currently exporting and the Virginia wine region as a whole. With continued support of the wine industry from the Commonwealth of Virginia, I am confident Virginia will become a world-renowned wine region. As an avid fan of the Virginia wine industry, it’s exciting to be able to purchase the wines of my home state on trips across the pond, and to be able to introduce these wines to my wine friends. I’m hopeful that overseas demand for Virginia wine will continue to increase and more of my favorite producers will be available in the UK soon. Thank you Chris for the great Virginia wine conversation. For those Virginia wine enthusiasts with friends in the UK, suggest they check out the Virginia wines available at their local bottle shop. For more information on New Horizon Wines, check out: NewHorizonWines.com and WinesOfVirginia.blogspot.com. Chris was also interviewed as part of this piece on CNN featuring UK and Virginia wines, here. I think it’s great to expand on the Virginia wine name, but the prices have to be competitive. What about the price points of the wines available overseas? Hi Jeff – thank you for stopping by to comment. You raise a great point about the price points of Virginia wine in London. Given the exchange rate, the prices are more expensive in London (as to be expected… it is London after all). I paid 17.99 GBP for the Barboursville Reserve Viognier, which was just over $27US at the time. This seemed a reasonable price to me. 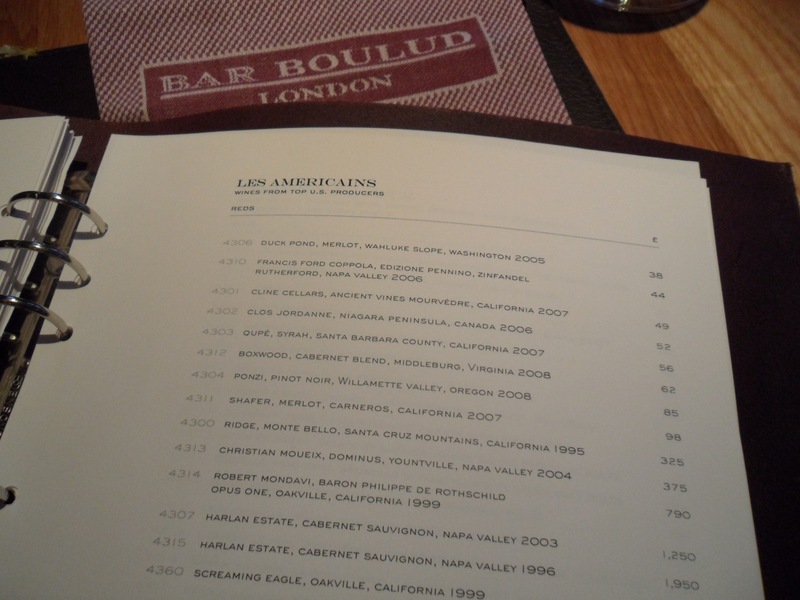 As you can see from the menu at Bar Boulud, the Boxwood was 62GBP (just over $90USD). This price point is higher than one would purchase this wine in Virginia, but to be expected at a high-end restaurant/bar in London. I talked to the Sommelier during our time at Bar Boulud and he indicated that the Boxwood sells well. Having a wine on the list at a place like Bar Boulud is big. I’ll defer to Chris for a better answer on the price points. Cheers! I posted a general comment which did not appear in this stream….it is further down the page. This is great — now let’s see if we can get Texas wines in London. Whole Foods Market stores in Texas carry lots of Texas wines so wouldn’t it be great if the Kensington store would carry Texas wines, too. My daughter in London would be so happy! Hi Denise – thanks for commenting. Perhaps someone from Whole Foods will read this. Given the size of the UK wine market, there is certainly room for Texas wine as well (especially those Viogniers). Of course, the beginning is consumer demand and an entrepreneur to make it happen. Cheers! It is a good question. I select wines for the UK market that are of high quality and represent good value in comparison with other fine wines from around the world. In any market one has to ensure that the customer is comparing “apples with apples”. I think the collective memory in the Greater Washington area is based on experiences of Virginia wines as it has grown over the last 30 years, which is not always pretty! 🙂 I think that has created an opinion of perceived quality that is lower than the actual quality, and therefore quality:price is out of balance. Approximately 65% of the total value of still wines in the UK sold for less than £5.00 ($8.00) per 75cl bottle. Most of these wines are sold through supermarkets and large retailers. We are working in the segment of the market that seeks interesting and exciting wines, that are looking for an experience, a story behind the label, discovery. Price is not the primary selection criteria. The ratio of high quality:good value is important to the people that buy our wines. The market will determine if the price is correct – Virginia wines are selling in the UK between £15-£28. We have spent the last two years building awareness, to educate and inform. We are storytellers that bring the full story of Virginia to the buyer, otherwise it is just another bottle of wine on the shelf. As word-of-mouth spreads, the story spreads. Our customers tell our story and validate our selection. Virginia will make its name in the world through high-quality, and signature varietals such as Viognier and Cabernet Franc. I am not saying that as an industry we should not strive to introduce wines of quality at a lower price if it makes business sense to do so. There will be wines produced at a lower price – e.g. Michael Shaps Virginia wine in a box, that offer new and interesting possibilities. If I can introduce a good quality wine at a lower price I will, but for now I will stay focused on building the reputation of Virginia as a high quality:good value wine producing region. Chris, It is impressive for Virginia wines to be sold in London considering many of the restaurants in my area don’t even have Virginia wines on their list or maybe one at most. I suspect Virginia wine would be sold for similar prices in any big city (especially NYC). I agree that Viogner and CabFranc will help make a name in the world, but believe the CabFranc offers the most potential. How does a winery go about having their wines part of the wines you offer in London? Are you looking for additional wines? I suppose you look first for Viognier and CabFranc? Thanks. Wineries can contact me at chrisparker@newhorizonwines.com. Viognier, Cabernet Franc, but not limited to these varietals. For example, Breaux Nebbiolo is part of our portfolio and it is very popular. It is great to see Virginia wine distributed in the UK. It is arguably the most sophisticated wine consuming country in the world. As Virginia Wine gains excitment elsewhere, we will gain further traction here at home hopefully. I am always a believer of the fact that your neighbors are always the most critical. It often requires those from outside to tell the local consumers how great a product they have at their own doorstep. This is a great step for Virginia wine and I look forward to watching its progress. Jordan – Great point about locals often needing those from the outside to point out how good Virginia wine really is. Seems as if many of my neighbors (Virginians) don’t appreciate the wines of our state simply because they are Virginia wines. Any plans to export Tarara wines? We would love to export at some point. The big question fo us is what the leading the best foot forward? I agree with your comment and we are seeing evidence of the impact of sales in the UK positively impacting sales locally. Talk to our friends at Breaux Vineyards – they can give you examples. I must come out to visit you sometime! I would love to have you out. I know that you have been doing incredible things for Virginia’s wine industry and commend you on what you have accomplished. There is some great juice around the State and often times it takes someone like yourself to lead the charge getting the word out. Sometime before the end of July? I will email you. If we could only get Virginian’s to believe in the quality of the wine produced in their backyard. This is affirmation by the UK trade that Virginia can make some high quality wines at competitive price points, and hopefully their will be some positive spill over in the market here locally. Chris Parker and his wife Janine are doing a fabulous job of marketing and getting our wines over there. Agreed that Chris and Janine are doing a great job at spreading the word. I have been thinking about a regionalized “Virginia wine education” campaign. Let’s talk about this. Hi Chris – we haven’t met yet (despite your office being just across the street from my house ;-), but I wanted to add my gratitude and encouragement for your work bringing Virginia wines to the UK. My husband, Rick Collier, and I both have family and education ties to London, so the thought of Virginia labels on the retail shelves makes us feel all warm and fuzzy. Stephen, Frank & Chris – if you guys need any support on building out or promoting a Virginia wine education campaign, please do let me know. Stephen and Frank already know this, but Rick and I have visited 160 of Virginia’s wineries in the last year, as we researched our travel guide iPhone app to Va Wine Country (it’s called Va Wine in My Pocket), so we may be able to contribute knowledge or logistical leg work. I’ve also got some background in educational program design, facilitation, and marketing if that’s useful. This really sounds like a lot of fun! It is encouraging to see the warm reception Virginia wines are receiving in worldwide locations where they are being promoted. This can only be good for the VA wine industry as a whole, as long as distributors and importers are very selective in the wines they choose to carry. This exposure will ultimately benefit all of us in the industry if it increases wine tourism in VA. Many of Virginia’s wineries are too small to distribute overseas. We, at Ankida Ridge, are strong proponents of the local food/wine concept, and given our micro-boutique size, selling to and serving our regional market is more our goal, keeping our production strictly limited so we can produce the very best wines our terroir can create. We look forward to entertaining not only regional guests, but also our international guests, and we can thank the promoters of international wine trade for Virginia for exposing the burgeoning Virginia wine industry to the rest of the world. I love the conversation that is happening on this subject! It is the combination of exciting wines, depth of history (particularly in connection with the UK), the beauty of the Blue Ridge, the Chesapeake, and other gems of this region the that makes the difference. Even in our local Virginia market we are serving an international community, competing with other wines from many regions around the world. “Think Globally, Act Locally” is true whether wine is sold within 50 miles of the winery or in the UK, or other parts of the world. You are focusing on your strengths and that is part of our strength as a region. You “…..produce the very best wines our terroir can create”. My vision and focus is to transform our local strengths into global strengths, which I believe will contribute to the growth of the Virginia wine industry and more broadly a cornerstone for sustainable economic development over the long term. As a micro-boutique winery your defined market is understandably local, and you are part of the fabric of the developing wine industry of Virginia. This is part of the compelling story that is exciting UK wine buyers. I look forward to meeting you sometime and tasting your wines. The pleasure would be mine, Chris. Bravo to you for all your efforts. I think your passion for promoting Virginia’s wines blends perfectly with our passion for creating those wines. I look forward to you sitting on our deck one day overlooking the beautiful Blue Ridge, sipping our wines! Great blog & discussion here. I’ve been fortunate enough to represent Breaux several times over the pond in London with New Horizon, and the wines have consistently received great reviews and warm welcomes from the British wine drinkers. I feel we can contribute part of that to Chris putting us in the right locations to reach the “right” people, but additionally I think there is a timing factor that is working in our favor as well. The British consumer seems to posses a growing hunger (or maybe I should say “thirst”?) for products like what Virginia wine has to offer. The vibe I get from the events I’ve poured is that they are bored with overpriced & over-predictable wines from the “classic” regions. They don’t strike me as being interested in the high ABV fruit bombs that were soaring in sales several years ago either. On the contrary, they seem enthralled by subtle, elegant and finessed (read: balanced) wines from unknown regions and from grapes that are lesser known or less often produced as a varietal wine. The fact that our wines boast “Viognier” or “Cabernet Franc” right on the front label has been enough to grab the attention of passing-by Brits who were excited at the idea of tasting these slightly off-the-beaten-path grapes (at least as 100% varietal wines). The combination of the thought of sating the seemingly palpable wine curiosities mentioned above along with the excitement of finding the next “big thing” to share with friends seems to be a tandem that is providing substantial wind in the sails of our mission to promote and propel Virginia wines forward in the sea that is the world of wines. It has been an exciting few years working on this project, we’ve seen a lot of great opportunities as a result of participating, and I have high hopes for what will come from the efforts New Horizon Wines, the Commonwealth of Virginia, and the wineries themselves, will offer to the cause. Hi Lawrence – thank you for stopping by to add your experiences to this discussion. I hope your peers in the Virginia wine industry realize and appreciate the amount of work Chris has done with educating the ‘right’ people/audiences in the UK about the wines of Virginia. I travel to the UK 3 times a year and have ‘seen’ the wine preferences of my friends change/evolve, as you noted from the higher alcohol fruit-bombs to ‘newer’ wines from lesser known regions. I find their wine curiosity refreshing (now, only if we could get more of our ‘California-palate’ friends to see the light). Thanks again for sharing your thoughts on this topic – hope to see you at Wine Bloggers Conference. Cheers! I look forward to more discussion on this topic. See you at the WBC11.